Wouldn't it be necessary to redefine the implementation of the neo-liberal paradigm? This is due to the fact that the growth in corporate profits is concentrated basically in big multinational corporations. In this context, SMEs, which are crucial parts of the business sector in most of the advanced economies, are particularly weak, except those that are able to be around multinational companies' supply chains, or have some sort of business relationship with them. Obviously, from a macro-economic viewpoint, the fact that, in a country, big multinational corporations account for a big share of production and employment could be understood like a benchmark and encourage foreign investments. But either way, we would still have economic growth/corporate profits concentrated basically in big multinational corporations, and not enough benefit for small businesses and the vast majority of the country's people. Besides, it is necessary to be aware about which foreign investment projects lead to economic growth, as well as economic sectors where a high level of growth is taking place. Normally, a liberal economic paradigm takes into account only income generated through foreign investment projects no matter how it is generated, and therefore some projects may harm human health and/or the natural environment. For instance, think about a country in which its government is forced to set lower environmental standards to attract foreign investments, whatever the social cost such investments carry. Consequently, factories freely pollute several zones or inclusive part of the country, but this way of manufacturing increases both self-sustaining growth and country's competitiveness into the international markets. From an economic point of view, the economic growth improves the living standards of citizens but at the same time pollution makes its inverse contribution to the quality of life of citizens. “It doesn't make sense to allow markets to work without any kind of rule, arguing that in this way they work more efficiently”. Obviously, foreign investments and economic growth are positive signs for a country, but to the extent that those investments do not serve as a trigger for growth and development based on industries that are prone to generation of bubbles. Governments should take steps to guide investments (foreign and domestic) to key economic and productive sectors in order to prevent speculation and high concentration of investments in unprofitable areas, as well as to encourage competitive market structures, because an economy based on only a few industries, apart from being very basic, is highly vulnerable to socio-economic crisis. 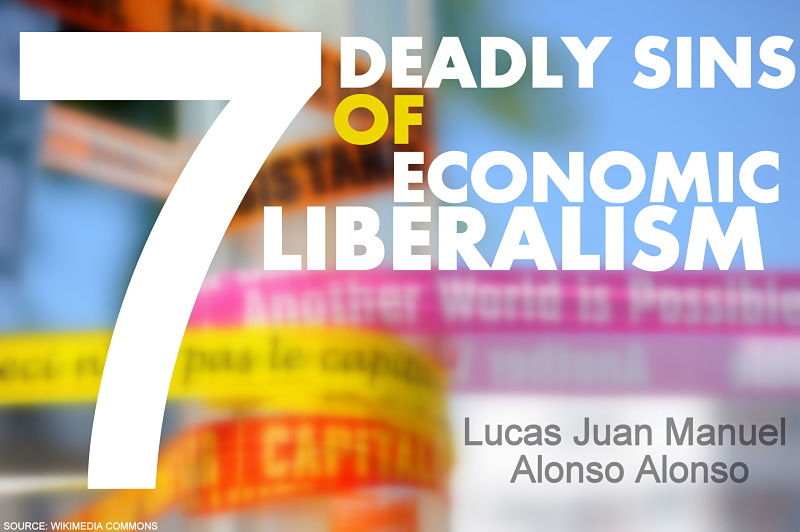 Neo-liberal policies do not encourage economic sectors that allow developing a sustainable economy, and thus, as a result, there are frequent ups and downs, bubbles, crisis and bailouts. "Unemployment is worse than create low wage jobs in places in which these are so desperately needed”. This is a constantly-repeated mantra by conservatives and neo-liberal economists. But, such a situation can be an option in a few very specific cases, only for short periods of time, and in economies in transition and can never, therefore, be a variable to formulate long-term economic policy in advanced economies. Precarious and poorly-paid work, greater labour flexibilization, excessive working hours, workers on temporary contracts (more "flexible" working methods, such as employment contracts for a few days or hours with miserable wages), increase of informal employment without any social security coverage, layoffs and a clear tendency towards subcontracting (this leads to self-employed workers with very poor incomes. Neo-liberal Governments brazenly refer to this sad reality under the name of "new entrepreneurs")... This framework of employment policies leads to a vicious circle of socio-economic impoverishment of significant tiers of a country's population as a consequence of reduction of social security contributions, reduction in purchasing power and weakening of middle classes, higher rates of poverty, inequality and social exclusion. Large socio-economic inequalities lead to serious social conflicts, unstable governments and countries (Mediterranean European countries are an unfortunate example of this), and this leads to the collapse of foreign investment (especially direct investment). Wages must be worthy to improving the living conditions of the people because this fact leads to the creation or strengthening of middle classes, which in turn encourages purchasing power and strengthens domestic business structures. An example of this may be found in China where the social differences have been reduced. China has gone from being the world's factory to become a major consumer, both in the domestic and international markets. The growing middle class is making China more competitive. We have there an example of the positive effect in reducing huge social inequalities, and an opposite example in the European Union countries -mainly Mediterranean countries-, where a policy of low-wages is generating enormous social inequalities and making these countries uncompetitive in global markets when it comes to labor costs, because advanced economies should compete through the quality and added value in differentiated products rather than trying to gain competitiveness through a strategy of low wages. Additionally, tax burden in many developed countries (some European countries are a case in point) started to increase substantially. Paradoxically, greater tax burden is placed on households, meanwhile, multinational companies listed on the stock market and great fortunes have a lower effective tax burden because these can engage in fiscal engineering. And therefore, a transfer of greater tax burden on consumer prices in combination with precarious/poorly-paid jobs and high unemployment rates are eroding consumer spending in many advanced economies. Neo-liberal policies do not improve tax equity. 3. Crony Capitalism: There are many "enterprises and entrepreneurs" arising from political clientelism (crony-ism and patronage), and that kind of enterprises and entrepreneurs do not generate wealth and prosperity in our societies because they are not competitive. This kind of capitalism is deeply disappointing for the real entrepreneurial spirit (genuine enterprises). Governments ruled by one-party for enormously long periods of time, laws encouraging the establishment of strong bi-partisanship in policy, religious hierarchies exercising their power in the political, university sphere and public life..., and many more similar supportive structures, encourage crony capitalism. In fact, this kind of actions increase corruption risks endangering country's long-term democratic transparency, because politicians can favour their family, relatives and friends in public or private jobs and, thus, in this way be able to create lobbies that ensure them a large number of unconditional voters, as well as to legislate appropriate laws in order to protect themselves and their clique of collaborators. In this way, wealth, well-being and prosperity are being concentrated in the hands of a few and the income gap between a country's richest and poorest people enlarges dramatically. “Obviously, this way of capitalism is inherent to political corruption and prevents equal opportunities in the economic and social spheres”. Economic liberalism triggers a socio-economic system based mainly on financial speculation jointly with inappropriate economic measures and structural/social reforms. Let’s take Euro area as an example. The EU implemented painful austerity measures in order to reduce the high level of government debt in many country members. But it was, and still is, a wrongly-conceived austerity. In fact, in various European countries the debt to GDP ratio is going onto a firm upward trajectory, thereby creating a possible risk of default. In this crisis scenario, the solution of the economic liberalism lies in drastic spending cuts in education, research & development, health and other public necessary services, together with a policy of privatisation of essential public services. Whilst, paradoxically as a consequence of crony capitalism, at the same time, unnecessary public spending increases, for example, unproductive public infrastructures development, which are intended to place people related to political and economic power in core positions...., wasteful of public funds brought about by opaque contracts...,and other bureaucratic wastages. GDP is a measurement that all governments and international organizations want to present as progress, but GDP is a measure of a country’s economic activity, and therefore it should not be considered a measure of a country's well-being. Nor does GDP give any indication of how a country's wealth is distributed. GDP takes into account all income no matter how it is generated and some GDP components may harm human health and/or the natural environment. Besides, it is necessary to be aware about which GDP components lead to economic growth, because a same amount of GDP does not mean identical situations. In several advanced economies, we have economic growth and, at same time, abject poverty, child poverty, growing number of food banks, extremely high unemployment rates, social exclusion…Some European countries, mainly those within the euro-zone, are a good case in point of this dramatic situation. “Economic growth does not seem to be the problem or the solution, but a fairer distribution of wealth... isn't it a logical conclusion?” In an economic liberalism, economic growth is distributed on just a few people, it never contributes to the general progress of the country that generates it and, therefore, accentuates existing inequalities, indicating a setback in the social progress of a country's people. “Neo-liberal economists consider human beings as merchandise. Under this premise, a country can be progressing economically at the expense of a decline in human development”. As a consequence of crony capitalism, a large part of the GDP can come from sectors engaged in speculative operations rather than competitive productive sectors that help to create a sustainable economy. Obviously, there is a clear situation of a highly unequal distribution of wealth, which leads to the decline of indicators that measure the extent to which countries contribute to the social, economic and environmental progress of their citizens. “Economic liberalism requires a socio-political framework for support”.This socio-political framework is in charge of defining the economic liberalism as the best and the only way ahead. This framework can be composed of journalists, large communications media, political actors and private lobby groups, entrepreneurs arising from political clientelism, religious hierarchies..., and similar structures that encourage crony capitalism. To be able to maintain this socio-political framework over time, it is necessary governments ruled by one-party for enormously long periods of time and laws encouraging the establishment of a strong bi-partisanship; usually, liberal and conservative governments, as well as social democrats with liberal socio-economic programs, call this situation "political and economical stability", and they say that this is the unique path to the country's progress. In my view, I cannot but be amazed before the use the word “liberalism” in order to reference to its economic policy; because the paradigm of economic liberalism appears more as a "disguised dictatorship" that favors sectarian interest groups and prevents free competition, rather than a doctrine favoring socio-economic equitable development. As a consequence, this political and socio-economic environment, necessary to sustain economic liberalism over time, leads to weak democracies and high level of corruption. A large proportion of the goods and services produced in cheap labor countries are exported to over-consumption countries, thus generating a vicious circle in which worldwide consumption is concentrated around a few markets or countries. The buying power of wages in these consumer countries (or markets segments of a population) will continue to rise (whereas, the buying power of wages in cheap labor countries will continue to fall or, at best, remain unchanged) at the expense of manufacturer countries. It is clear that the under-consumption into large sections of the world's population is a direct result of looking for cheap labor markets in which to manufacture and greater concentration of consumption around a few markets or countries. Around 20% of the world’s population consumes most of 78% of the world's resources, leaving almost 80% of the people living on the remaining 20%. Economic liberalism prevents the creation of a sustainable, fair and social global market economy. 7. Global Socio-Economic Imbalances:As explained in the above paragraph, there is a notorious imbalance in real global per capita income and global consumption. A huge percentage of the world’s resources are consumed by a small portion of the world’s population, meanwhile a high percentage of the world’s population is under a minimum level of consumption. Therefore, on the one hand we have over-consumption and at the same time under-consumption. Obviously, because resources are limited on a global scale, we cannot reduce poverty in a sustainable manner by engaging everyone into an over-consumption lifestyle (an economy based on continual growth and increasing demand), but by a paradigm that best combines the creation and distribution of wealth. It is necessary a socio-economic model capable of equalizing opportunities' upwards by achieving that a majority of the world's population tends towards a sustainable economy; it is the only way in which we can reduce the gap between over-and under-consumption. While a paradigm of equalizing opportunities' downwards remains predominant (economic liberalism/conservative ideology), socio-economic inequalities will be exacerbated by generating a greater consumption of the world’s population classified as extreme-consumerist. “Places where to hire cheap labor force and to sell luxury goods to elite” are fundamental axioms of the above-mentioned economic-political ideologies that lead to impoverished societies, in which it is necessary to adjust production downwards in response to lower domestic consumer spending, thus generating a vicious circle of economic growth based on exports, precarious jobs, social inequalities and poverty.